In need of a compact and ultra-fast external data storage? 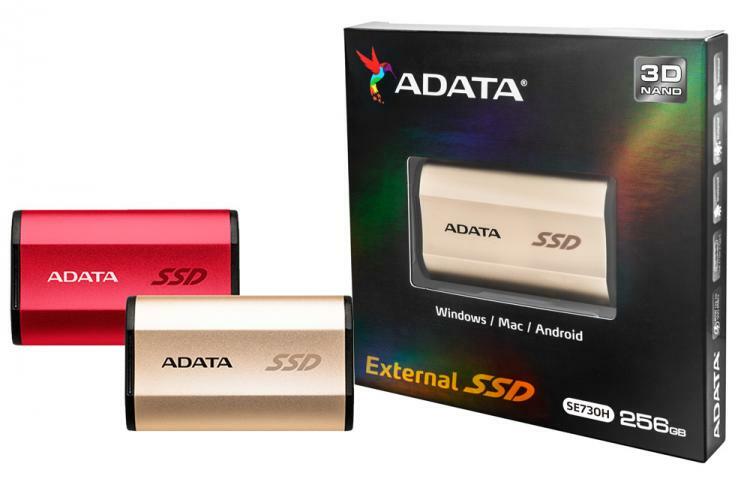 ADATA’s SE730H 3D NAND USB-C external solid-state drive offers blazing read and write speeds of up to 500 MB/s via its reversible USB-C connector. Using USB 3.1 Gen 2 interface, the ADATA SE730H is one of the world’s most compact high-performance external SSD offerings today. Aside from its convenient USB-C, compact size and speedy transfer speeds, it also meets military-grade shock mitigation standards as well as the IEC IP68 dust and water proof requirements. The ADATA SE730H is available in 256GB and 512GB capacities and supports Windows, Mac OS, Linux and Android for a seamless cross-platform compatibility. The ADATA SE730H is available in stylish gold and red colours. Its compact footprint makes it easy to store and transport and it only weighs a mere 33 grams. With 3D NAND flash, it is also 25% more durable compared to 2D NAND thus giving you a longer lifespan. The reversible USB-C connector also gives convenience ensuring connection with a single attempt. Using USB 3.1 Gen 2 speeds, transferring a 5GB file only takes 16 seconds! The ADATA SE730H sure is the next-generation compact, speedy and tough storage solution to date. Dimensions (L x W x H): 72.7 x 44 x 12.2mm / 2.8 x 1.7 x 0.4"
For more information on the new ADATA SE730H 3D NAND USB-C External SSD drive, visit the ADATA website.